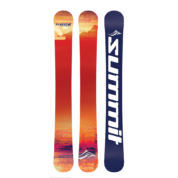 “EZ” is what the Summit EZ 95 cm Easy Ski Skiboards 2019 white are all about. These are truly “Easy Skis” offering almost instant parallel carves and quick turns, yet performance at speed without the chatter you may find in lesser quality constructed skiboards. 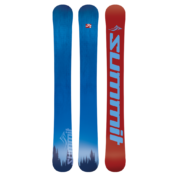 “EZ” is what the Summit EZ 95 cm Easy Ski Skiboards 2019 white are all about. These are truly “Easy Skis” offering almost instant parallel carves and quick turns, yet performance at speed without the chatter you may find in lesser quality constructed skiboards. If you’ve never skiboarded before or never skied before, these are the ones to get. Due to their parabolic shape and slightly narrower tail, these EZ’s are truly great carving tools. Beginners and intermediate riders will find a quick escalation in their ski abilities. Yes you can learn to ski in one day! 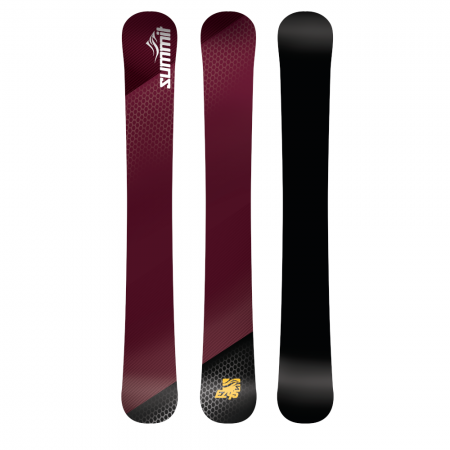 Handcrafted, one pair at a time, with extreme attention to detail, this season’s Summit EZ 95 cm Easy Ski Skiboards 2019 is constructed with a vertically laminated tip-to-tail wood core. This creates a consistent tip to tail flex that brings a new level of carving to skiboards. Made for all mountain riding, the wide body tip is great for groomed runs as well as anywhere else, including crud, ice/hardpack or light powder. With asymmetrical twin tips, you can still go backwards or spin down the mountain if you choose. Recommended for: beginning to intermediate riders. These are among the best skiboards to learn on, have immediate fun on the slopes and yet advance to advanced levels quickly. Great for: groomed runs, hardpack, moguls. Tuning: These come with edges fully tuned and ready to ride. We provide a free hand hot wax before shipping. Bindings: These can be pre-mounted with the Atomic L10 release bindings for the perfect combination of safety, flex and step-in-and-go performance. This includes free mounting. L10 bindings feature: DIN range of 3-10. Twin pivot. Toe height adjustment. Adjustments can be done by hand and fits ski boot sizes 261-384 mm (approximately US size 4 – 14 U.S.). These can also come with Atomic L7 release bindings that combine high performance with minimal weight and maximum stability. This offers excellent release values and is easy to operate. Adjusting the front clamp and heel can be done by hand. These bindings feature: DIN range of 3-7.5. Twin pivot. Toe height adjustment. Adjustments can be done by hand and fits ski boot sizes 229-336 mm sole length (approximately US Size 2-11). NOTE: You can also purchase without bindings and mount your own bindings. Snowboard Bindings: The EZ 95 has inserts so you can now purchase our Technine Custom Pro DS Snowboard Bindings that include the Summit Snowboard Binding Riser Kit for the perfect way to ride with snowboard boots. 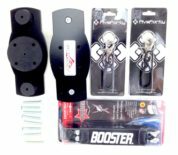 These were designed by us to work perfectly with skiboards, while allowing you the comfort of using snowboard boots on your skiboards. For 4 years running now, these have a proven track record of skiboard performance with snowboard boots. The Custom Snowboard bindings feature 3 padded rachet straps to hold you in place when carving. This allows a more stable interface between boots and bindings. 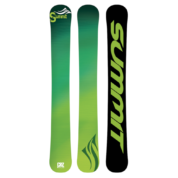 Includes two Quick Leashes by Five-Forty ($9.90 value) and Summit Snowboard Binding Riser Kit. Fits snowboard boot sizes 7-14 US. Cap construction: These are designed with a cap construction, a parabolic sidecut which was constructed to function impeccably with the solid birch wood core to deliver almost effortless carves and will hold an edge no matter how hard you charge it. The high energy, lively wood core is sandwiched between two top layers and one bottom layer of triaxial fiberglass providing just the right combination of flex and torsional stiffness that offers an incredibly smooth ride. In addition, an extra layer of biaxial fiberglass and kevlar is added to maintain the smooth tip-to-tail flex allowing just the right carving feel as well as adding to durability. Wood Core: full length wood core made of Northern Hemisphere birch. This wood is very light, yet super strong. Colder temperatures create wood that is denser, thus super strong, while being very light in weight. This vertically laminated wood core allows for a smooth flex throughout the board and a highly responsive energy as well as greater long term durability. 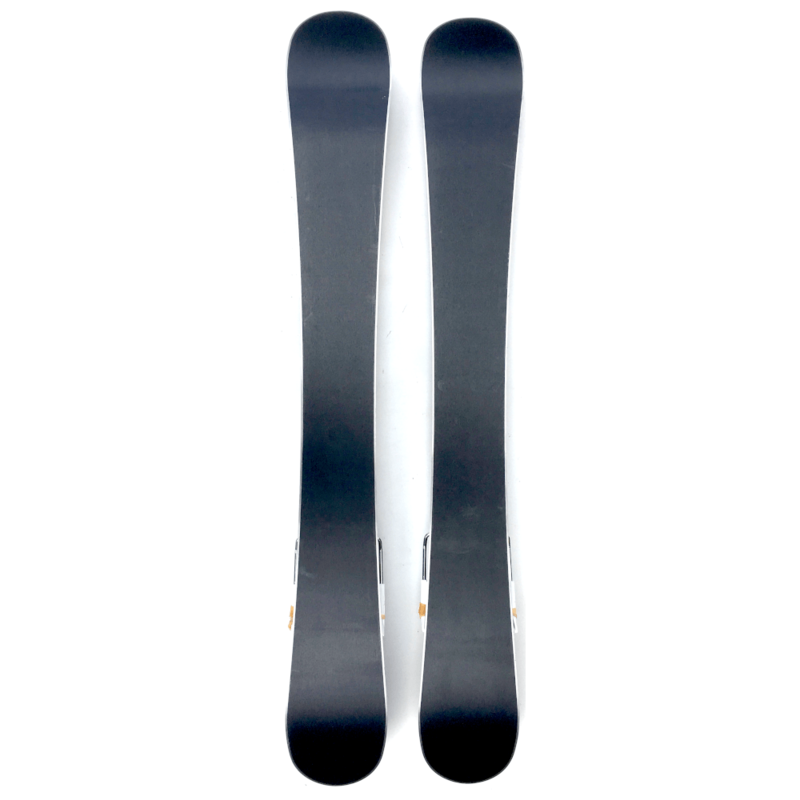 Wider Body Front Tip: a large front skiboard surface area for maximum stability, floatation and speed. Asymmetrical Twin-tips: makes it easier to ride forwards as well as backwards. Excellent handling in the parks and pipes. Also, makes for the most perfect carves. Sintered bases: this is one of the best base materials for durability, maximum wax absorption and speed. These black p-tex 4000 bases have less friction and thus more speed as well as less vulnerability to abrasion and impacts. Polyurethane protective top layer: protects top sheet from dings and chips. Custom fit aluminum reinforcement plate – perfect for those who prefer extra reinforcement to retain their release bindings. This set up provides maximum retention no matter what bindings you prefer to use. Rubber dampening layer: makes for additional smooth riding, absorbing those vibrations, but allowing maximum road feel. Edge bevel: 1 degree base and side bevel of 89 degrees – great for carving with ease as well as aggressive carving. Intended for maximum hold on ice, hardpack and lay it over carves.